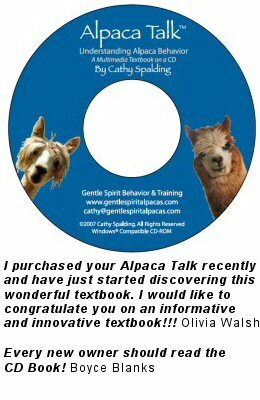 Special Offer: Buy one or more copies of Alpaca Talk and get a free copy! Works like a Web Site. Print Behavioral Guidelines, chapters, text and photos. Put them in a notebook for a complete textbook. Use your new book, comparing the pictures and text, while you are observing your alpacas’ behavior. Easy to Use, Easy to Read! Just place the CD into your computer's CD drive. ALPACA TALK starts automatically and does not download onto your computer, only playing when the disk is in your CD drive - just like a music CD. ALPACA TALK will display on your monitor with a display resolution of 800 x 600. ALPACA TALK will work on all Windows® Operating Systems but is not Macintosh® compatible. and a description of how to use the book.